Ever now and then along comes a great book. This is one of those. 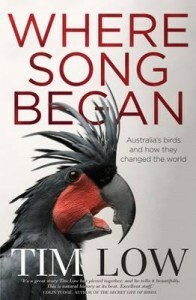 If you already admire Australian birds, this book will still change the way you think about them. I will never be able to walk past a group of Choughs and not wonder about if one of them has been kidnapped from another group and is now being used as a slave. There are many such fascinating things about birds in this book. Rather than providing another full review – I recommend this link to Readings Books – it says it all. Click here. But, please do not buy this from Amazon (see articles about them – click here).